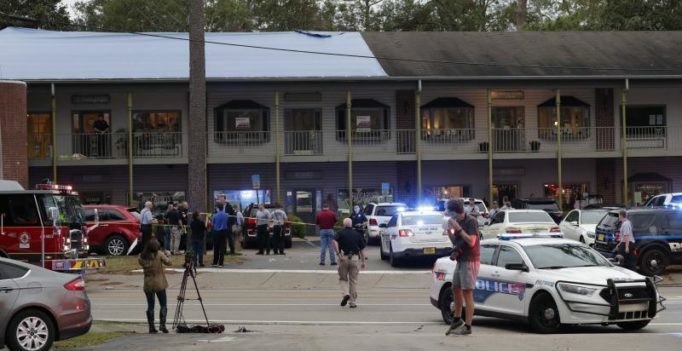 Florida: A shooter has killed two people and critically wounded five others at a yoga studio in Florida’s capital before killing himself, officials said. During a media briefing Friday night, Tallahassee Police Chief Michael DeLeo said four people are in critical condition following the shooting, which took place in a small Tallahassee shopping centre. The suspect fatally shot himself, DeLeo said. City spokesman Jamie Van Pelt said the shooting appeared to be a part of a domestic dispute. DeLeo said police haven’t identified the shooter and are asking for anyone who saw something unusual around the time of the shooting to contact police. He said the shooter acted alone. City Commissioner Scott Maddox was on the scene. He said on Facebook, “In my public service career I have had to be on some bad scenes. This is the worst. Please pray.” Elle Welling said she was leaving a liquor store across the street from the shopping centre and saw at least three people loaded into ambulances. The plaza is home to popular restaurants, a jewellery store, a framing shop, a hair salon and other businesses. Tallahassee Mayor Andrew Gillum, who is the Democratic nominee for governor, tweeted that he’s breaking off the campaign trail to return to Tallahassee. He earlier appeared at a campaign event with former president Barack Obama. “I’m deeply appreciative of law enforcement’s quick response to the shooting at the yoga facility in Tallahassee today. No act of gun violence is acceptable. I’m in close communication with law enforcement officials and will be returning to Tallahassee tonight,” Gillum tweeted. Republican Gov. Rick Scott, who is challenging Democratic Senator Bill Nelson, called DeLeo and the head of the Florida Department of Law Enforcement to get details of the shooting. “I will remain in constant communication with law enforcement. We have offered state assistance,” Scott tweeted. Tallahassee’s crime and murder rate has been an issue in the governor’s race, with Gillum’s opponent, Republican former US Representative Ron DeSantis, calling the capital Florida’s most crime-ridden city, a claim that is incorrect.